QLogic, together with its partners, has been constructing high performance interconnect fabric solutions for HPC clusters in multiple markets for years. With extremely low latencies and impressive bandwidth, QLogic fabrics allow high performance computing environments to process greater workloads and scale to larger configurations than ever before. Bandwidth of up to 20Gbps, and switching latencies measured in microseconds means more effective applications. 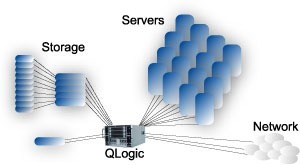 QLogic's HPC solutions are based upon InfiniBand, a common industry standard providing open interoperability, and volume cost efficiencies while supporting connectivity to existing networks.